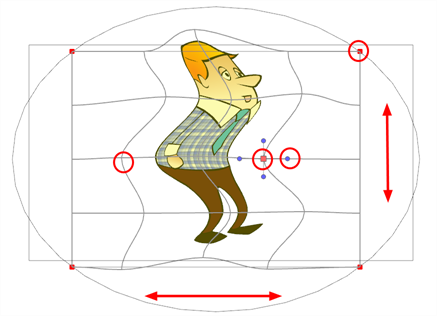 Use the Mesh Warp effect to distort your drawings. With this node you can create effects such as a character in a warped mirror and looking through a glass jar. 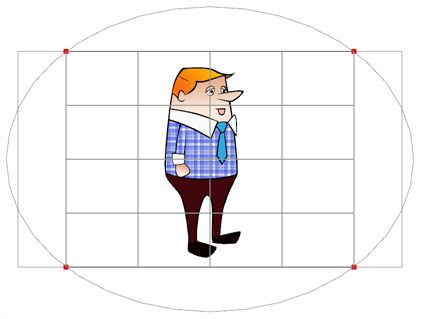 You can also animate the position of the grid to perform the distortion over time. The Mesh Warp node is a position node, same as a Peg node. 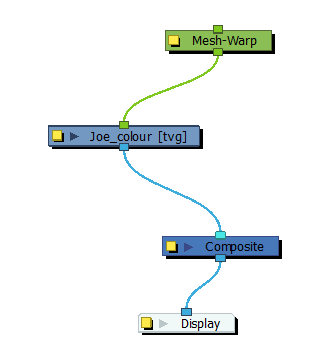 In the Node Library, under the Filter tab, select the Mesh Warp node and drag it to the Node view. In the Node view, connect the Mesh-Warp node to your drawing or group nodes to deform. In the Node view, select the Mesh Warp node. Select View > Show > Control or press Shift + F11 (Windows/Linux) or ⌘ + F11 (Mac OS X) to display the deformation grid. Move the intersection points and move the Bezier handles to deform the grid. Grab the grid in the void spaces to pan it around. 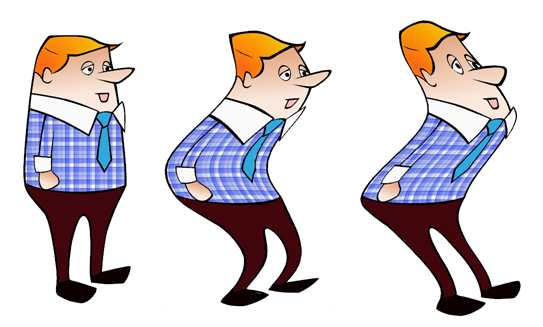 Using keyframes, you can animate its position over time. Use the Mesh Warp editor to adjust the grid size, deformation quality and the region of interest. Rows Increase or decrease the Rows value to change the amount of rows to use in the deformation grid. Columns Increase or decrease the Columns value to change the amount of columns to use in the deformation grid. 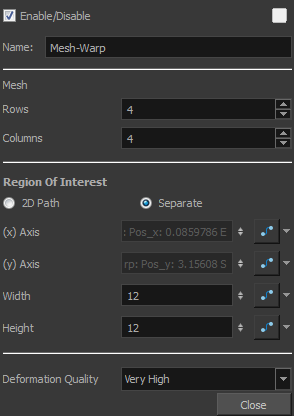 Region of Interest Select the 2D Path option if you want both your X and Y curves to be controlled by the same velocity function. Select the Separate option if you want your X and Y curves to be independent and have independent velocity. (x) Axis This is the X position of the gird. This value can be animated overtime to move the grid horizontally. (y) Axis This is the Y position of the gird. This value can be animated overtime to move the grid vertically. Width This is the width value of the gird. This value can be animated overtime to squash or stretch the grid horizontally. Height This is the height value of the gird. This value can be animated overtime to squash or stretch the grid vertically. Deformation Quality This is the quality of the warm deformation. It ranges from Low to Extreme. The higher the quality, the better the formation will look, but the longer it will take to render.